Festival Applications and Creative Writing DUE – All disciplines including Visual Art! All artwork must be picked up from UCC after 2:30 pm – The office will not be responsible for artwork that is not picked up by 4:30 pm. Several art and photography pieces from the Festival will be selected for the Union County Touring Exhibit. In addition, the County may choose pieces for publication in a brochure or other promotional materials. Please indicate on Master Sheet if any entry is not available for such purposes. Please submit one application indicating total number of student entries. Submit separate visual art Master Sheets for each category (i.e., 2D, 3D or Photo). IMPORTANT: Complete all information requested. Applications due by January 22 and Master Sheets due by February 22. Send originals, please do not fax. Complete separate Master Sheets for each category (i.e., 2D, 3D, photo or computer graphics) and circle category where indicated. Labels to attach to your entries are enclosed. Please duplicate as needed. Each entry must include: Artist’s Name, School, County, Grade, Age, Teacher, Title & Medium. Only one entry per student is allowed. Student must be present for critique in order to be selected for further venues. Hanging Instructions: All 2-D pieces must be appropriately mounted and/or matted. Work must stay on the panel without falling. Unframed pieces must be wrapped in acetate – including the mat. Framed works: DO NOT USE GLASS! Use PLEXIGLASS only. All pieces must be suitable for public exhibition and representative of your school. Several creative writing pieces from the Festival will be selected for publication in the Union County or Creative Writing Anthology or used for other Teen Arts purposes. Please indicate on the application if any entry is not available for such purposes. Creative Writing due with applications January 22. Critique sessions are scheduled only for students whose work is submitted with application. Please have students bring 2 copies of work submitted to the Festival. One entry per student in either Poetry or Fiction/Essay. An entry consists of as many writings — IN ONE GENRE ONLY — as can fit on a maximum of THREE pages. Use one side of standard 8½ x 11 white paper with 1″ margins on every side, typed, double spaced. No hand writing. Use a standard font i.e., Arial or New Times Roman. 12 pt. minimum. At top right of page please show: Student’s Name, School, County, Grade, Age and Page Number (i.e., Pg.1 of 1; etc.) Give your poem, short story or essay a title. Submit everything in duplicate: Two (2) copies, each individually stapled. Please be certain students understand that they will attend an assigned critiquing session at the Festival with a professional writer for a discussion of the writing they submitted. Students must attend critique session to be selected for further venues. 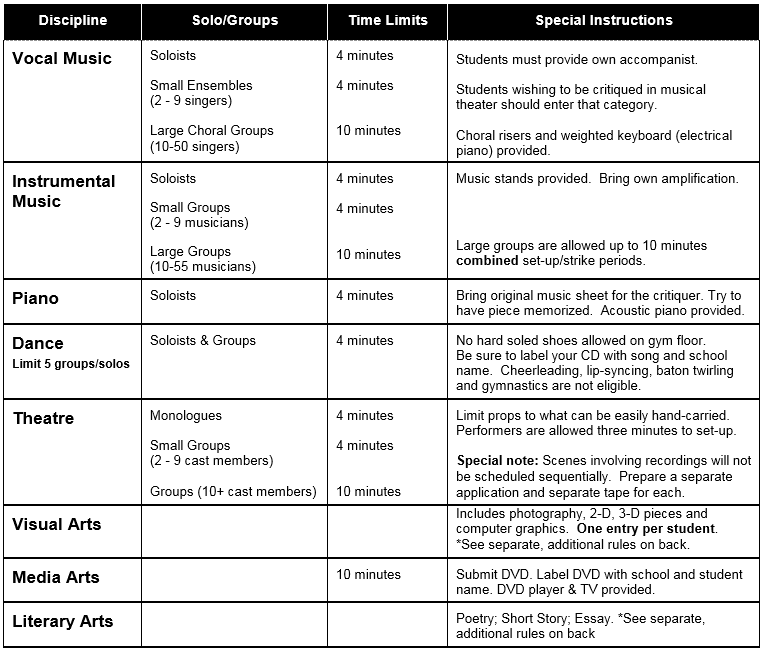 This form is required in order for student or group’s performance or work to be scheduled for a critique session. Teacher must complete this form separately for EACH performance or writing submission. (Save this form onto your computer, then complete and re-save.) For Visual Arts ONLY, complete one (1) form for ALL teen participants. Please list each teacher involved and their corresponding discipline and e-mail address each on their own line.